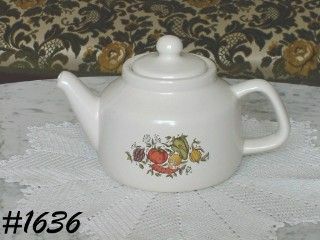 This listing has a mint condition McCoy teapot from the Spice Delight dinnerware line! Teapot is marked on bottom: 163, McCoy, Lancaster Colony (mark), USA. It is a beautiful matte white color with bright, clear vegetable (Spice Delight) decal. Teapot looks new and unused -- no chips, no dings, no cracks, no crazing -- excellent condition! !